Bad news. Well, not that bad, but the engine is still in the car. We'd hoped to have it out by now, so we could finish up all the welding and paint the frame. We might be able to get the engine out this week, but several things have to fall into line for that to happen. First, we need to get hold of an engine hoist. And actually, that's the only thing that needs to fall in line. We can do the rest ourselves. Meanwhile we tacked together the pedal box recess. 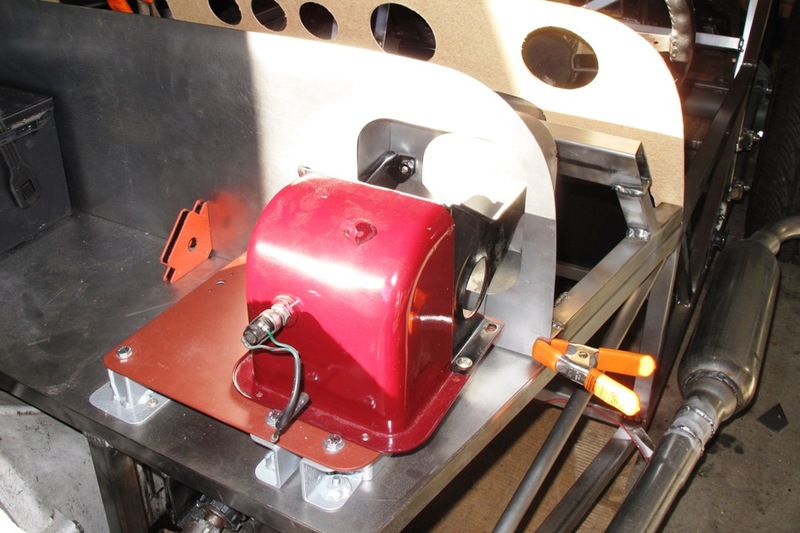 Amazingly, it went together just like we drew it up, with an 18-gauge backplate and a 2-1/2" wide strip of 20-gauge steel between the backplate and scuttle firewall. Although we followed the plans exactly, we weren't expecting any of it to actually fit, because the whole thing is made out of sheet metal, and some of it even had to be bent. It's nice that it worked out, but if it turns out we're actually improving with this sort of thing, that could end up taking a lot of fun out of the project. Looks better out of direct sunlight. But not much. We also spent some time cutting out the last of the transmission tunnel panels. Starting with our cardboard templates, we cut the panels slightly oversize, and then trimmed each panel to fit. 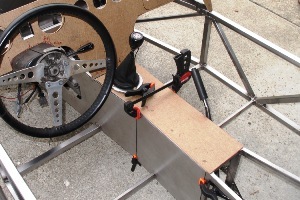 The only extra work was on the driver's side, where part of the transmission sticks out into the footwell. We knew about this from the beginning, so it was totally expected. Honest. 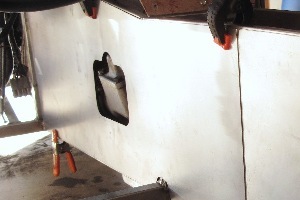 We cut a hole in the panel, and all we have to do is make a bump out of 20 gauge steel, and weld the bump over the hole, which we hope to do without major panel warpage. We also hope to get as lucky when we weld the panels to the frame. Unfortunately sheet metal really likes to warp, especially when it gets hot. 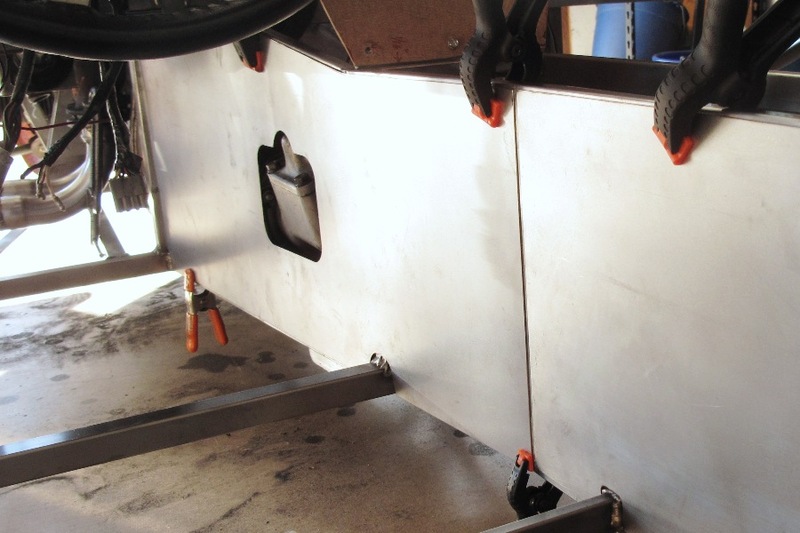 A lot of Locost builders avoid warping by riveting aluminum panels to the sides of the transmission tunnel, but that sounds kind of flimsy to us. Not that aluminum and rivets are totally useless, but they're not welded steel, and so they're at least 50% useless. Of course our Locost will have a few riveted aluminum panels too, but they'll be mostly appearance items so it's not the same. We also made templates for the top of the transmission tunnel. These panels will be removable, a feature that will allow us to remove them should it ever be necessary to access the driveshaft, hand brake, or myriad wires and tubes that we hope will someday run through the tunnel. 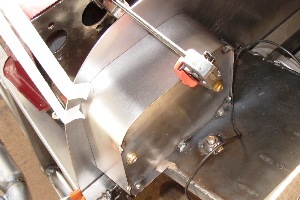 The panels will bolt to mounting plates that we have yet to design, but which should work based on our conceptual model of a screw, a hole, and a blind nut welded to something. 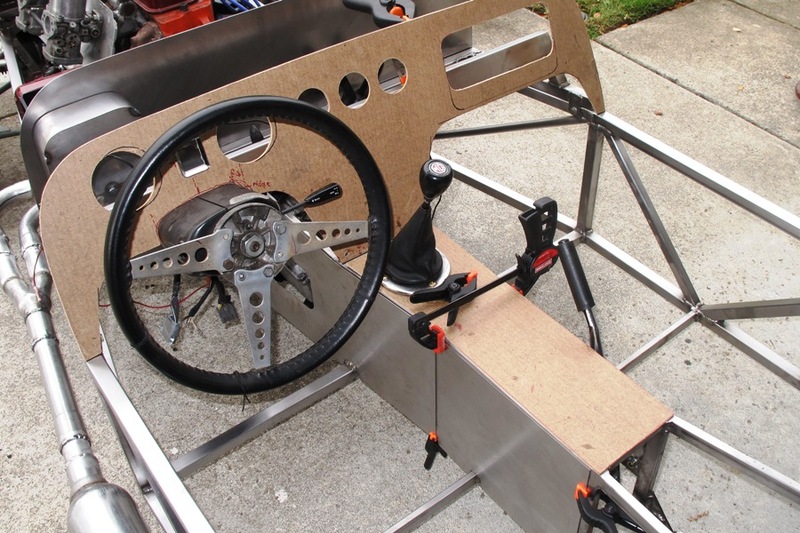 We're not 100% sure what to make the panels out of, but we're leaning towards aluminum. Now that most of the metal work is done we have a little time to look ahead to what we need to do to get the car running. Really just three things. Hook up the fuel system, hook up the brakes, and run enough wiring through the car to electrify the starter, alternator, fuel pump, and ignition. We also need to shorten the driveshaft, if we want the car to move once it's running, but we're going to farm that out so it doesn't count. A clutch would be nice, too, so maybe four things. We've got about 80 hours of frame prep left before we can start on these, once we get the engine out of the car. So that's our priority right now. Getting the engine out of the car.